These are things I wish I could tell you as you begin your journey in private practice as an intern. No one will EVER ask you what your GPA was in grad school. (Well, one client did, but his son was in my practice for anxiety…hmmm.) So, don’t stress it while you are studying. Just learn what you are supposed to and enjoy the journey—you will miss the opportunities to learn and discuss (but not the papers and exams). I know more than my clients do. Telling clients I was an “intern under supervision” was one of the scariest things in the beginning. I was sure they would say, “I’m outta here. I want someone who can actually help me!” No one did run or tell me that. In fact, once they were in the office, they stayed—I’m good at connecting with people. My life experience couples with my clinical training and awesome supervision gave me the edge I needed. I can charge what I’m worth. I thought I would have to charge $25 per session because that’s what all the interns before me did. I sat down and made a list of what I knew and what I need to learn. Surprisingly, all the extra training and interests, books I’ve read over the years, and my life experience being married 20+ years, raising 3 daughters, actually gave me a competitive edge. I started out lower than I am now, but worked my way up. I’m worth it. You are too. You have unique experiences no matter how old you are. You have a reason you pursued this career. Capitalize on that and think about all the work you’ve done in that area for yourself. Helping people heal is like taking ecstasy! Well, I’ve never taken ecstasy but I hear it’s like the love drug. That’s exactly how I feel when a couple I’m working with begins to heal, lowers their escalation and begins to fall in love again. All the dopamine centers in my brain begin firing. It motivates me while working with the tougher couples I work with. There is hope and I’m a vessel for healing in their lives (not the only one, but one vessel they can access). Transparency is okay in the therapy room. Remember #2? I thought I had to pretend I knew everything. I don’t. When I’m stuck with a couple, it’s okay to share that. “Hey guys, I’m feeling like we are getting stuck in this same place, are you feeling that too?” Usually this opens up conversation for where they are getting stuck and I don’t have to do all the work. I don’t have to see 45 clients a week. I’m exaggerating, of course, but I found a good number of clients that I feel comfortable with each week. They get the best of me when I stay within that client-hour range. There was one month during my internship that I saw 25+ clients a week. I was exhausted, irritable with my family, and not doing my best work. I got sick the moment I slowed down. I made a decision that this was not in my best interest. So, I raised my fees a bit with new clients and see less. The BBS does eventually approve your hours. The past few years it has been a long seemingly endless wait for hours to get approved, but it meant I got an extra year of supervision and experience. Silver lining. I don’t have to know everything and I don’t have to figure it all out on my own. Are you seeing a theme here? There are people out there, like Miranda, who LOVE to help you succeed. There are free resources available and ones worth paying for. They are investments in your current and future practice. Take advantage of them! Want more specifics on how I did it? Feel free to contact me. Miranda has amazing resources and is so willing to connect with you and connect you with others, don’t miss out on what she provides. Are you looking to get a paid internship? Well, in many areas of the country the competition is fierce and the jobs are scarce. And you know what that leads to? A lot of of fear, frustration, and hopelessness. Calling all pre-licensed therapists! You CAN be successful- even in this economy! I'm going to give you some tips to finding a paid internship as a MFT Intern, ACSW, Associate LPC, etc. today. I think it is crazy that I should even have to write this one down. It seems so obvious. And yet, I talk to therapists who are searching high and low to hire pre-licensed therapists for private practice internships. What do I hear about? While I know that none of you would ever do this. I want you to take a moment to think about this. A private practice internship is someone's baby. It is a licensed professional's small business that they built from scratch. It is should (hopefully) be successful if they are looking to hire someone to come to work for them. However, an unprofessional therapist who dresses poorly and doesn't know how to carry themselves could lead to more than just a headache for the supervisor. It can lead to a loss of new clients, a loss of income, and even the loss of the business. It is a VERY big deal for someone to trust you with their practice. Their business will be judged by your actions. So, put a little extra oomph into your dressing choices. Dress as you would if you were presenting at a state conference, or you were going to be on Television. If you find the position is more casual- great. But never assume. And prepare for that interview! One of the key tips i describe in my job interviewing 101 podcast are ways to gather information about the position you are interviewing for. Understanding the position more completely prepares you beautifully for an interview. You need to know what they are looking for, and, you need to know whether this is even a position you want! Private practice internships are not like traditional agency jobs. In 95% of cases you don't show up and see clients. In fact, if you find an internship where you show up and see clients- chances are the pay will be low, or non-existent. A successful private practice internship gives you an opportunity to legally market your psychotherapy services. It is a chance to present yourself to the world, start to build your reputation online (and offline), and it can be the foundation with which you launch your own private practice after you get licensed. You want a therapist who is going to give you freedom to develop your own website, market in the community, etc. If you get an internship where you aren't allowed to do these things, you are going to have difficulty finding clients- either now- or when you launch on your own. A private practice internship that includes the responsibility to market your practice isn't a minus- it is a plus. It is a perk! Having a clinical supervisor who expects you to get clients means having a supervisor who understands how business works and will have more support for you as you move forward. A private practitioneer is looking for someone who doesn't just "want to go into private practice someday" but someone who is "preparing to launch a successful private practice in the future by taking specific steps today." Are you passionate about starting a private practice? Are you willing, and ready to learn about marketing, business planning, business boundaries, clinical boundaries, and more? 3. Don't wait for things to "happen." I see many therapists who are complaining that there are "no jobs." While therapists in the exact same places are getting offers from multiple positions. How can this happen? Are some therapists just "lucky?" Maybe. However, every pre-licensed therapist I've seen experience this has made some very specific choices. They make time for trainings and networking early and often in their careers. They are well known by licensed and pre-licensed therapists alike. They are strategic in their thinking and have a bigger plan in mind. Do you have a goal of starting a private practice once licensed? Start developing your specialty today. Start your blog today. Start building a contact list today. If you wrote even 1 blog per month, and got even 30 new subscribers per month, in 3 years you would have over 1000 people on your e-mail list. Google would know who you are, 1000 people would know your name. Let's say 50% of those people unsubscribed, and only 1% of those that were left wanted to become your client when you opened your private practice. Do you know what that means? Five new clients when you open the doors. 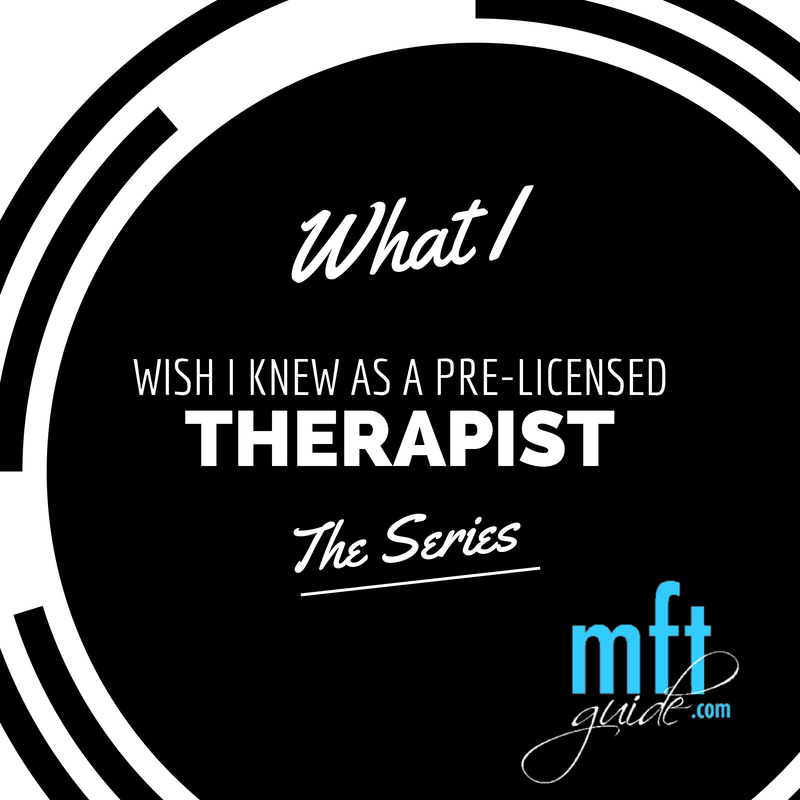 Pre-licensed therapists, you can be successful! Think outside of the box. You have (or are getting a master's degree). Build your reputation, make connections, and choose to be successful. You can do this! (Are you on the list? If not, get on the list and you'll get the Job Interviewing 101 podcast send out to you after a few days). 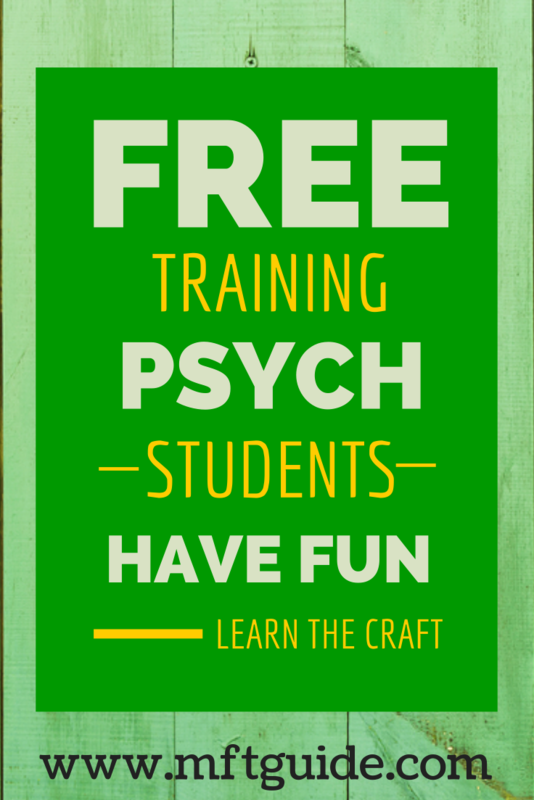 I always LOVE finding new free resources for pre-licensed therapists, especially graduate students. Your career does NOT start after licensure. It starts right now, this moment, even as you are getting educated. Good Therapy has a free student level membership that gives you access to free recordings of trainings given by industry leaders. How cool is that? #1. Go and grab your free GoodTherapy student membership. #2. Schedule time at least once per month to take an online training. Schedule it as if it was a LIVE training. keep that time sacred. #3. As you take that training, post about what you learn on social media on your personal or professional accounts. Have a little fun on twitter, Facebook, reddit, whatever you are already engaging on. #4. include the training on your resume or curriculum vitae, and add it to your LinkedIn profile. #5. Love the training? Consider giving a shout to the presenter and Good Therapy on Twitter and follow them both. You might just make some great connections and meet some awesome people! #6. Share this post with your colleagues. And yes, I mean colleagues. They may seem like classmates today, but they will by your colleagues soon enough! Develop yourself as someone who is passionate about learning more about your craft today. And, as you take each of these trainings, use it to improve your online reputation. Later, as you are looking for positions, you will already have started to develop your professional network, which will make the process of getting a job, and starting a private practice easier and more fruitful! Did you know that a lot of established therapists feel a bit jealous of the next generation of therapists? Seriously. They are jealous of how many more options you have for marketing your practice. They are hopeful that you will have or develop the skills to have a great online presence and reach clients who need you. How cool is that? While some of you MFT Interns and ACSWs are "digital natives" many of you are coming to psychotherapy as a second (or fifth career). You decided to give yourself permission to do what you are have always dreamed of doing in your deep down heart. Learn about how great therapy websites work. Whether you have any technology background at all- a business website is a bit more complex than a regular website. If you aren't in private practice yet, start a website anyway. Start letting google get to know you, and start building an online reputation- even if you have no services to offer yet. Just start the process of sharing expertise. Start to develop an expertise or passion you feel comfortable sharing. You don't have to be the all-knowing guru to have something amazing to share! Get over your fear of sharing your passion. Your clients deserve a fearless therapist! Ok, well maybe not fearless- but let your passion for connection overshadow your fear of judgment from others! Start learning private practice marketing skills now. The sooner you learn them, the more clients you will be able to help! Side note: I have wonderful clients who send me notes when I miss typos on my private practice website. They are still happy to work with me and are comfortable that I'm not going to be teaching English anytime soon! Don't think you are tech savvy enough to build your own website or blog as a therapist? You are! Seriously. It is easier than you think to get started! Click here or on the pretty picture below to get started! Also, know that your clinical supervisors might like this free course too! So, share away! Help! I can't get my "kid" hours in California! "I'm struggling with getting paid kid hours. I need 400 kid/family/couples hours, but work at an adult outpatient program. I really feel hamstrung b/c I'm not bilingual. Seems like that is the "open sesame" code for paid kid gigs these days, and without that...."
Without getting those minimum 500 hours in family, child, or couple's counseling- you can't get licensed in California as a Marriage and Family Therapist. In many other states the licensure and experience is 90% focused on working from a family or couple perpsective. California is one of the only states where one could get licensed and have never done 1 marriage counseling session! But- what you really want to know is- how do I get a paid gig where I can gain these hours? While I am going to focus on someone who is working with adults who wants to switch things up- I believe most of the rules apply to therapists who have seen primarily children who want to expand to working with an adult population. Step #1: Start where you are at. If you are already working in an organization, start by doing an assessment of your work there. Might there be a way to take a new look at what you are doing and suggest to your supervisor, or to your clients, integrating more couple's or family therapy work? Conjoint sessions are the first step to doing couples and family work, and your supervisor will likely still sign off on conjoint sessions- even if the family or child isn't the mode of treatment. Offer a workshop aimed towards children, parenting, or relationships to start wheels turning. Let your clinical and agency supervisor know your predicament. If you are awesome (and I will assume you are), people will want to help you overocome this last obstacle. Whether that means coming up with a plan that truly benefits your current job placement, or making recommendations on your behalf to help you get a gig elsewhere- supervisors who care will make it happen. Do you think being bilingual is the only thing that gets you hired? I am going to disagree with you. Speaking a second language is absolutely an amazing skill and adds value. However, there are so many things that tie into your value as a therapist, as a colleague, and an employee. Take some time to really explore what is great about who you are, the specifics of things you have done, and what sets you apart. Are you not sure? Do you feel like a dime a dozen? that is a cognitive distortion that will tank your opportunity for success. I have supervised amazing therapists who are bilingual, and some that only speak English. Personally, I am not bilingual and have created amazing opportunities for myself again and again. It isn't always easy- but it is possible. And, the skills you learn to get great jobs, are the SAME skills you will need to create a great private practice! What did we just talk about above? Sounds like business skills to me! p.s. Are you in a private practice internship, or do you plan to launch a private practice? Several interns just went through the Business School Bootcamp and found it to be personally and professional transformative. You can get on the list to find out about the next bootcamp here. Stop waiting for licensure: You can be successful right NOW! Did you know you be successful as a professional right now? Did you know that your career is happening right now? Not after you finish your hours, not after you pass your first test, now after you get licensed, not after you start a private practice, not after you have a full case load. Your career, and your profession is happening. Right now. As. We. Speak. Do you feel helpless? Powerless? You shouldn't! You are either on your path to getting a graduate degree or already have one. You have already made the huge decision to make helping others your passion and mission. What would happen if you thought of yourself as a professional today? I want you to message me at miranda@mftguide.com and tell me what you would do- and I will add it to the list! If you want step-by-step support in doing much of the above, desire accountability, structure, and click-by-click videos for getting things done- sign-up to be interviewed for the Business School Bootcamp. Learn more about the Business School Bootcamp here. I'm not big on selling stuff on this site, but having talked to several interns this week who felt like our program was exactly what they needed- I'd hate not to tell you about it! I learned a lot from that experience. Mostly what I learned is that I already had what it took to do that. And, if you are going through the process of getting licensed- by the end- you will have what it takes to. It is all about continuing the movement forward, and NEVER stopping. Notice your progress, look slightly ahead- at what is just in front of you and just KEEP MOVING! I know there are a lot of steps, a lot of obstacles, a lot of pain between deciding to become a therapist, and actually completing your goal. But, you know what- you CAN do it! So today, we are going to talk about having the right "gear" and a bit of the right preparation. Thankfully the gals over at Spartan Chicked on Facebook got me as prepped as I could be for my race. 1. If you live in California, but you aren't using www.trackyourhours.comto track your hours and manage your paperwork- seriously do it now. It is one way you keep moving forward. With some of the delays at the BBS- it is even more important to get your hours submitted immediately after finishing them. Start getting original signatures on experience verification forms asap. This link: https://www.trackyourhours.com/zynnyme/ gets you 3 months free! Now, I have completed two of those crazy LONG runs, and 2 others- in fact I did 3 of them in about 6 weeks. You are much stronger than you know! Go out there and finish the race guys! So exciting seeing pre-licensed therapists passing the standard written exam and the clinical vignette exam for becoming licensed as a MFT! The old school Yahoo Group I have been hosting for several years had gotten consistently attacked by spammers, and it was difficult to keep up to date. The new Facebook group is allowing for hosting the group without headaches for me! Woohoo! And more importantly, it is letting pre-licensed folks get together to talk about study materials, testing strategies, anxiety management, and how to become a successful professional! People are sharing their feedback on Gerry Grossman, AATBS, Amanda Rowan, and other test prep materials so people can choose the right study materials for them! If you would like to join us, we would love to have you! Pop on over here: https://www.facebook.com/groups/mftguide/ And click on "Join Group" in the top-right hand corner. FREE Webinar for Therapists! ------------------------------------------------------------ Email not displaying correctly? View it in your browser (http://us4.campaign-archive2.com/?u=10551de47bde66a2ef3950530&id=f33a7dff6b&e=3e6c9e5e3c) . http://zynnyme.com/strategy-session// Hey there MFTGuide peeps! Part of becoming a successful therapist post-licensure is creating a career that you LOVE and that you get PAID for! Our FREE Profitable Private Practice Webinar (http://zynnyme.com/webinarpp) is getting some major buzz and we are SO excited! It is happening in just a few weeks! Have you checked out it yet? We just got back from a state-wide awesome conference- where we met two main groups of therapists- those that believed that success was possible (and probable), and those that believed it was an impossibility in the current economy. Come one, come all and hear real stories of how therapists are becoming successful in the current economic climate, and get real inspiration for taking your business to the next level. We really want you to be there- so be sure to save your seat! This a LIVE event, no replays or recordings- just a great group of therapists, helpers, and healers getting together to learn LIVE! Yep. You will have access to the entire Project at no cost to you. Details on how to apply for a scholarship are here<http://clicks.aweber.com/y/ct/?l=AHolF&m=3fH0BO.YveXEccf&b=3K8B22NH0rSCAgdfJ2PZRw> . Do I have to have supervision if I am pre-licensed in California (or in other states)? [image: Inline image 2] I have spoken to clinicians (MFTInterns, Associate Clinical Social Workers, LPCC Interns etc.) who believe that supervision is simply there to *allow you to count your hours of experience. * While sometimes it is the case that pre-licensed therapists are working in a spot where supervision is a luxury and not a necessity-* those situations are few and far between*. I like to use the example of a driver's license. If you wear glasses, you know that upon receiving or renewing your driver's license, an eye exam is performed to determine if you qualify for an unrestricted license. If you aren't able to pass the vision test, you receive a restricted license. As an MFT Intern, MFT Trainee, Associate Clinical Social Worker, or LPCC Intern you have a restricted license. That means anytime you are doing psychotherapy work you have to work within the confines of that restricted license. And guess what, if something goes wrong, and there is an accident, *even if it isn't your fault*, you are exposing yourself (and your license) to *more liability! Remember lawyers are taught to look for ways to blame you for what happened. * * * Yikes! This is not meant to scare you, but to give you some information so you can better protect yourself and your career that you have worked so hard to pursue. You are a professional today, you follow the law, and you need to know the laws so you can better assert your needs. What can you do today if there is an issue? - Call your professional organization for consultation and to run through options. - Very politely express your new found knowledge and partner with your employer to find a solution. - Network with other professionals to see how they are managing this issue. p.s. Currently I am not taking any new supervision or coaching clients through / You may post questions you would like featured on the blog- but I will not be providng distance support at this time. I am working hard on some cool projects over at http://zynnyme.com to help therapists create the practice they envision. I do have some fun things planned for http://mftguide.com but not until early 2014- so make sure you register for the newsletter so you can keep "in the know." Low-cost training for pre-licensed and licensed people alike. Get out there and meet people and get some advanced training! Coffee and Refreshments Provided. Pay online by credit card or register online and send in your check, Click here for online registration<http://click.icptrack.com/icp/relay.php?r=20990191&msgid=501973&act=2WFJ&c=194100&destination=https%3A%2F%2Fcirinc.wufoo.com%2Fforms%2Fhow-do-we-talk-to-our-kids-about%2F>. All payments must be received by April 26th. *Continuing Education Units*: This course meets qualifications for 6 hours of Continuing Education Units for MFTs/LCSWs as required by the California Board of Behavioral Sciences, Provider #4128. Participants may register the morning of the conference. CEU's are $25.